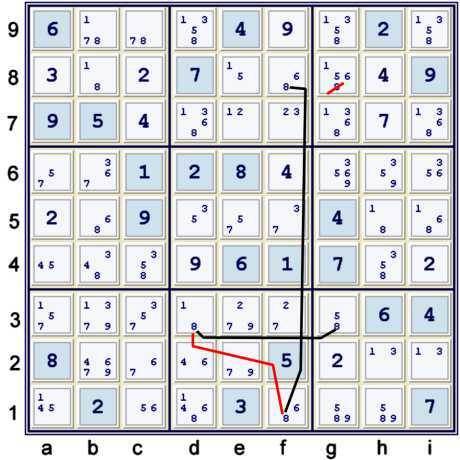 The following is an illustrated proof for the Tough Sudoku of March 30, 2007. This proof uses only Forbidding Chains, also called Alternating Inference Chains or AIC. At many times during this illustration, there are other steps available. Some easy steps are not taken, nor illustrated. This page only illustrates steps that, taken together, unlock this puzzle. Quite often, Hidden sets are easier to find before entering the possibilities. Illustrated to the left, g5=4 and c5=9 conspire to force only 49 at d4,f6. Clearly, then, candidates 357 must be locked at def5, thus one has the eliminations noted in row 5. It is rare that one will find a hidden triple without considering the possibilities. While looking for Hidden Pairs, I noticed the almost Hidden Pair 27, illustrated in orange, at e23,f3. 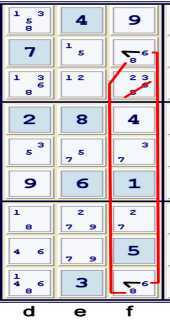 Since I can also see that the 9s are locked in box e2 because e23 are the only places left for 9 in column e, not only can I eliminate 9 from the rest of box e2, but I also can place the Hidden Triple at e23f3 as shown. There is some value to recognizing that one has the Hidden Triple indicated above based only upon the information cited: c5,a7,i8=9(thus locked 9s at e23); bi1=27; d68=27. Very rarely, one may use such a group of conditions within a chain to justify an Almost Hidden Triple, eliminating a key value from one of the Hidden Triple cells. Admittedly, that concept is advanced, and somewhat obscure. Fortunately, this puzzle does not require any sort of logic that advanced. One now can solve g2 = 2% cell. This step is a set up for the fist truly difficult step. Let me know if this notation is preferable here. In my puzzle mark-up for this position, the 1 at b3 was underlined, with a V next to it, pointing at cell a8. This was a great clue that not only this chain existed, but also that it would at least solve one cell: c8=3% cell. One may note above that I did not bother to eliminate the 1s from d79 caused by the locked 1s at e78. This elimination, and some other easy eliminations available here, are not significant, one way or the other, to this puzzle proof. Illustrated to the left as a continuous nice loop forbidding chain, the naked pair 68 at f18 forbids 68 from f7. This elimination is a required set up for the final non-native elimination step. causes a cascade of Unique Possibilities (mostly naked singles, a few hidden ones) until the puzzle is finished. This proof is not the exact path that I illustrated, but functionally the same. 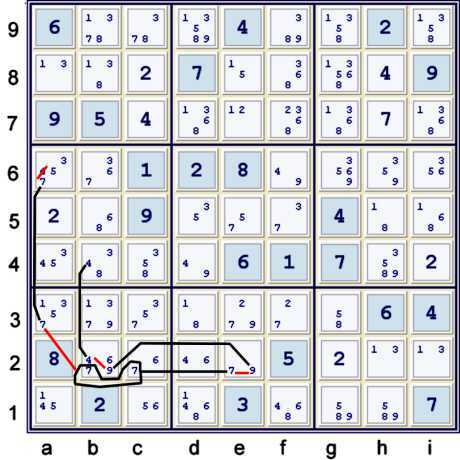 Start at 22 filled - the given puzzle. Unique Possibilities to 25 filled. (UP 25). This puzzle is quite tough, but not monstrous or diabolical. One could fool around with the steps and achieve a rating of .70 by using the Hidden pair 49 and 3 locked candidate eliminations versus the naked triple 357. Since this took more space, I choose the latter. I suppose that now I have consumed the space saved! 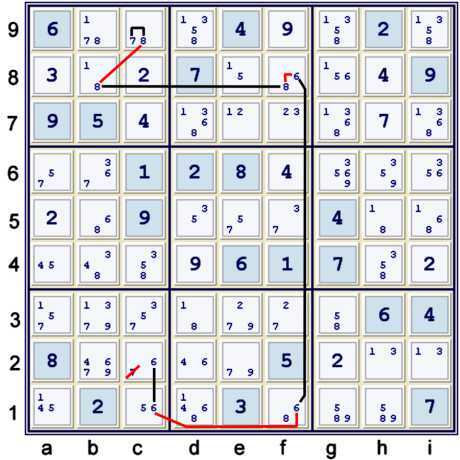 This puzzle is standard forbidding chain fare. Nothing really exceptional about it. A workman-like approach to tackling this one will solve it. If one prefers fewer steps of greater depth, there are quite a few other possible paths to take. 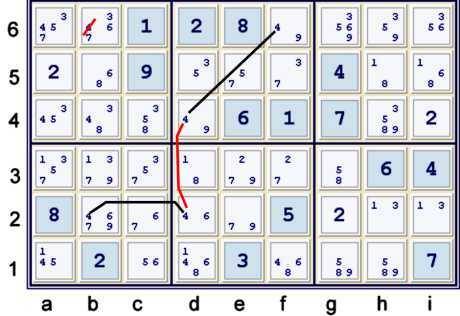 I found a large number of depth 5 and depth 6, and even some depth 7 or 8, forbidding chains. 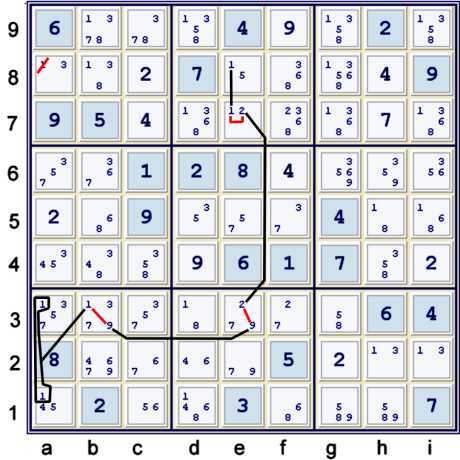 In fact, an advanced forbidding chain of about depth 8 or 9 is possible at UP 29 that forbids c2=7 and reduces the puzzle to Unique Possibilities. My preference is more chains of lesser depth, but others may well prefer fewer chains of greater depth. Please let me know of interesting alternative proofs to this one, as I strongly suspect many are possible. I feel that I missed something easy here, and that this particular proof does not represent my best work! The only things one can say for sure that are thus eliminated then are: f4=6, d5=3. I too wish that the exchange of ideas - especially sudoku ideas - at this site could return with the energy that once existed here. Thank-you for posting a proof in an attempt to help that return. Steve, Thanks for looking at the chains and your comments -they definitely need a bit more work! Cheers. I shall endeavor to study better the Eureka notation, so that if I use it in the future, I use it correctly. Also, I suppose I should correct the page!